Cigar News: Keeping ahead of the FDA means sometimes you need to work with them. Checking for the legal age to use tobacco products needs to be part of the retailers watch . Hard to get in trouble with the FDA if you are complying with their age restrictions. 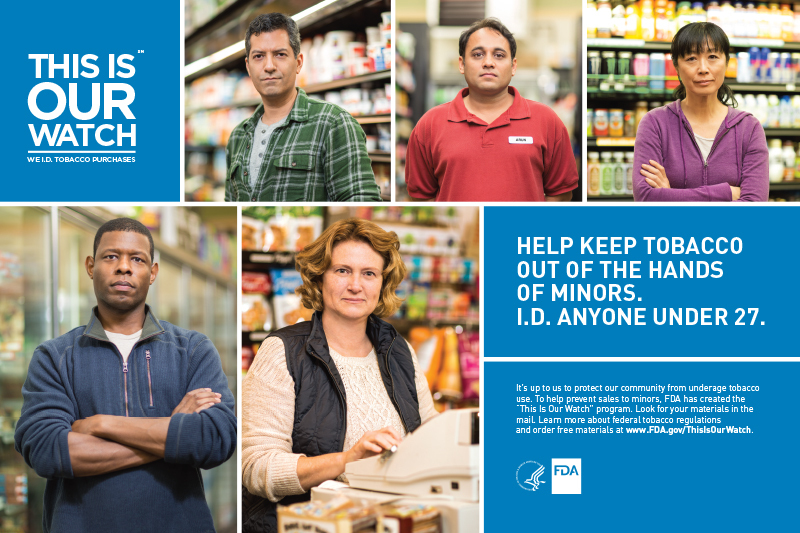 This month, the U.S. Food and Drug Administration (FDA) officially launched “This Is Our Watch”, a program geared toward tobacco retailers to help tackle an issue both the FDA and retailers are concerned about–age verification. Headed by the FDA’s Center for Tobacco Products (CTP), “This Is Our Watch” offers retailers education, point-of-sales materials and training that will help comply with the agency’s age verification and compliance rules aimed at keeping tobacco products out of the hands of minors. The program was designed using feedback from retailers and though it’s not required, it could prove helpful to retailers as violating age verification rules can come with costly ramifications. These materials are available to retailers at no charge. Some of the material available through this new program include an instructional booklet that includes training tips for employers to help their employees and an overview of the “This Is Our Watch” program, posters and point-of-sales signage to help communicate to customers about age-restricted products, stickers that can be placed near registers and around the store, easy-to-read flyers to distribute to employees covering age restriction rules at they apply to various tobacco products including cigars, pipe tobacco and hookah, and a calendar and app employees can use to easily calculate a customer’s age. It is reported that as of Oct. 1, 2017, the FDA had conducted more than 842,000 inspections of tobacco retailers and issued 65,000 warning letters informing retailers they were in violation of the law. Of that number, 15,400 civil money penalty cases were initiated and the FDA had issued more than 85 orders to stop the sale of tobacco products to retailers who were in violation. “This Is Our Watch” was designed to not only address the issue of minors having access to tobacco products but also reducing the number of retailers in violation. To download your free “This Is Our Watch” kit and material, click here. For more about what to do if you are a retailer that has received a warning letter from the FDA, click here.